David Kelly is the founder of IDEO and the Stanford D School. 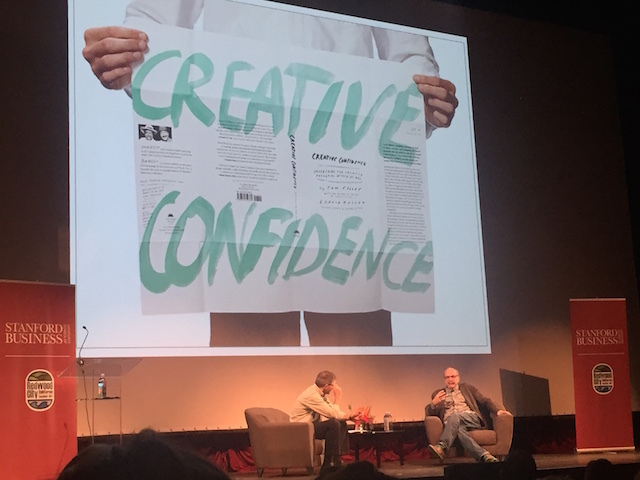 Today I had the opportunity to hear him speak on the topic of Creativity; how to foster it and how can we all unleash our creative selves. This post is a collection of notes, anecdotes and stories from the evening. I found that his ideas can not only help us better ourselves, but can also serve as guidelines to help us manage others. The evening began with 3 songs from the Talisman A-Capella group. Their songs were amazing, with roots from South Africa, and served as a great display of creativity. 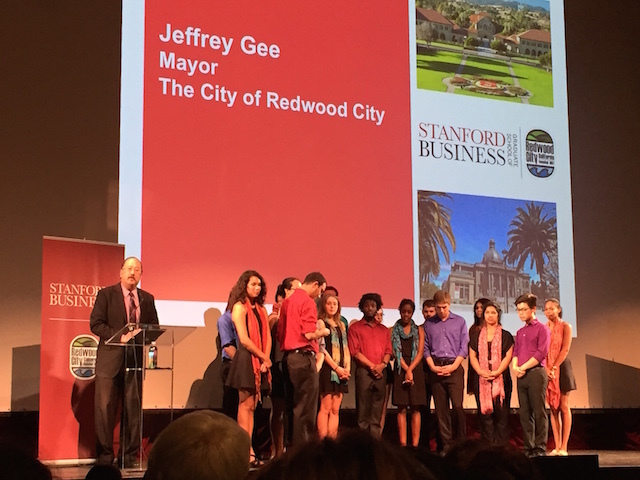 This was followed up by a quick intro from the Mayor of Redwood City, before the keynote speaker. The Mayor introduces David Kelly while Talisman prepare for their last number. Why aren’t people more creative? People are often categorized as reserved or analytical. For example, Engineers or Mathematicians, tend to value predictability and structure. Everyone is creative but they need to the overcome the fear of criticism and get a sense that they can do what they want without being judged. One of the most wonderful things is to see a person realize they are creative. It can be highly emotional for some. Mr. Kelly loved that spark he saw when people realized what they could do. This is why he has been pushing design and creativity even though he is a mechanical engineer by trade. You need to try new stuff. Take risks. Do not be afraid of failure. In fact, David doesn’t like or believe in the word “Failure”. When something doesn’t go right, you learn from it. Advancing your learning is a “small success” not a failure. People are wildly creative, they just need permission and support. There are three (3) important parts to something truly innovative. 1) Feasibility – the technology must exist to make it possible. 2) Viability – you must be able to make money or otherwise sustain a business with the product. 3) Delivery – the team and mechanism exists to actually get it into people’s hands. But there is one thing you cannot ignore. “Human Centeredness”. Will people actually like using it? For example, the Segueway was a technical marvel and could be sold at profit, but people look like dorks using it. No wonder it failed! The greatest success of IDEO is that they have empathy for people. If you want to affect how people use things, you really need to get out and talk to them! A bunch of people sitting around a conference table with their laptops can’t really figure out what people in the real world want. It takes time to get out there and meet with people, but the payoff is huge. These two things are not enemies. Sure it’s great to take in all ideas and try new things, but when you provide structure people can focus. Constraint is good in this case and you can build structure around it. People will think very differently if you tell them build something for $100 vs $10. David does not believe in initial planning. Teams need to dive right in and get messy. Figure out the real problem before you build a plan and follow it. You may be solving for the wrong thing. IDEO loves to get people with wildly varying views to look at a problem. A lawyer, artist and a teacher will not think alike. A man and a woman will not think alike. Unique mashups of people will lead to great discovery. How did this screen design happen? just don’t know how to be heard or put their idea in action. In response to this question he offered this little story. Ex: Shell hired IDEO to figure out why people were having so much trouble with their gas pumps. 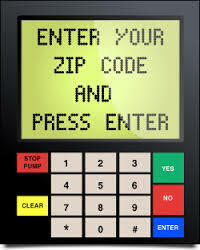 Men would swipe their credit cards and enter their zipcode. When nothing happened, they would swipe again. After a few tries, they left in frustration. Women on the other hand would go ask the station attendant why the machine didn’t work. He would tell them that they needed to press the “Enter” button after entering the zipcode and it would work! It was this that led to the instructions “Enter zipcode and press Enter“. What can you do to be more creative? Frame new ideas as an experiment. Let people know that you want to try something new but if it doesn’t work, we can go back to doing it the old way. This mindset works wonders as people are less afraid because they know that there’s a safety net. Take action! Thinking about it gets nothing done. Go out there and try something. If it doesn’t work out, course correct. Don’t try to plan everything out. Use Mind Maps. Start with an idea and ask “Why?” Take the resultant answer and ask “Why?” After a few levels of this, you’ll get to the essence of the issue. Develop a “Yes and…” culture. People need to be encouraged to try things and learn from mistakes. How can you tell a introverted engineer from an extroverted engineer? The introverted engineer will look down at their feet as they are talking to you. The extroverted engineer will look at your feet while talking to you. Q: Besides the word “Failure”, what other words do you dislike? Q: What industries are ripe for creative change? A: Healthcare and governments. We need to start small (Singapore) and find out what works. Then scale it out! Q: What your favorite failure? A: A beautiful phone I created that got into the Museum of Modern Art. But it wasn’t viable. By the time it got to the retail channel, it was so expensive that no one wanted it. I have 4,000 phones sitting around in my garage. At least I got in to the Museum of Art. A: For this century? It’s the car. For the today? It’s the drones! Q: Being creative is great, but you can’t continue ideating forever right? A: This is why you must have constraints. Sometimes it’s time and money. The Future is already here. It’s just not evenly distributed. I really enjoyed the talk and it gave me a lot to think about. Whether it’s helping my team at work, improving myself or encouraging my kids; fostering creativity is a great thing. If this post has peaked your interest, you can view a bunch of videos of David Kelly’s talks on YouTube! This was a cool website in the mid-90’s! No animations, interactive menus, I-Frames, CSS or responsive design elements. Just a few JPGs and some different text sizes. DeltaPoint’s website circa 1996. Created by QuickSite. Around 1995 I huddled up with a few friends including Bill French (the creator of LapLink for us seasoned tech folks) and thought of an interesting way to create websites based on a database. HTML was just starting to emerge and many people were trying to learn this new “markup” language. There was no WYSIWYG (What you see is what you get) tools and building decent websites was hard. The concept was simple. Create templates for a website structure and let people type in the content. The tool would worry about the HTML tagging and keeping the structure intact. Furthermore, changing the content would be simple since you could just update a database form and magically it’d be presented as a web page. We’d call it QuickSite. We wrote a business plan, created v1, pitched the idea and bingo! QuickSite was sold to DeltaPoint in a deal valued around $6M bucks. That was pretty good money “way back when” for a technology company with 3 people who didn’t raise a cent. DeltaPoint QuickSite went on to become the #1 selling website building product in retail stores (remember those?) and won over 8 industry awards. It was also the beginning of my startup phase. Now with over 6 startups under my belt, I realize that it’s not so easy! Fast forward to today and almost all websites are build with dynamic content generated from a database. Think Amazon, Yahoo, Google, etc. etc. 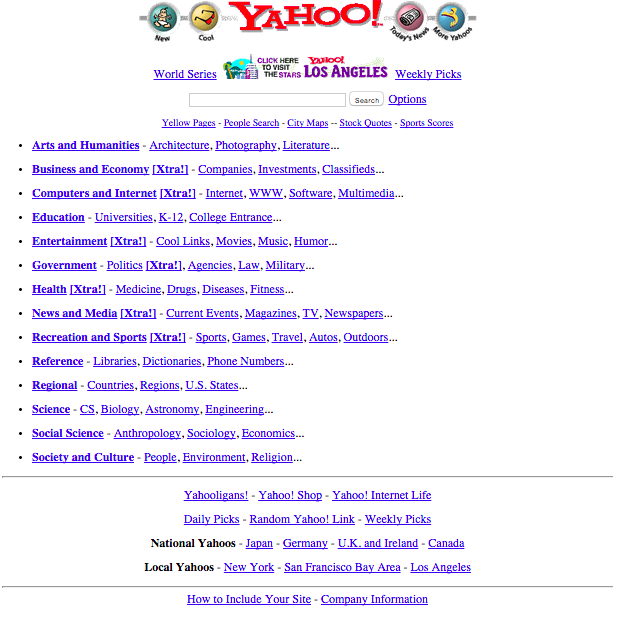 Just as a comparison, here was Yahoo’s website in October of 1996. Thank goodness for the WayBack Machine for capturing this bit of history.